Frontline National has proven their experience and commitment on providing fantastic opportunities to their candidates. We are excited about proving ourselves and utilizing the opportunity to give you the same experiences as our previous candidates since 2004. Please contact us on our current opportunities and how we can provide our expertise in your career search. Frontline National is a National Recruitment Firm serving in the health, engineering, security, and IT sectors. Frontline National, LLC was founded in 2004 and is a nationally-renowned staffing firm dedicated to identifying and placing superior candidates who possess the qualification, energy, and talent to match the high standards of client's expectations. Frontline National is a Women-Owned Small Business (WOSB) and an SBA certified 8(a) firm, headquartered in Cincinnati, Ohio. Frontline National's conscientious staff is dedicated to providing superior customer service to our clients and candidates. We have a proven track record and marketplace expertise to successfully recruit and place professionals on a National scale. Frontline National is proud to announce its participation in the Department of Defense Military Spouse Employment Partnership. 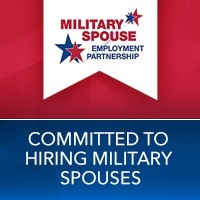 The Military Spouse Employment Partnership is an employment and career partnership connecting military spouses with hundreds of partner employers who have committed to recruit, hire, promote and retain military spouses in portable careers. Frontline National officially joined the Military Spouse Employment Partnership on Oct. 2, 2017, at the annual Induction Ceremony held at the U.S. Chamber of Commerce Building, Washington, D.C. The Military Spouse Employment Partnership was launched on June 29, 2011, as part of the White House's Joining Forces Initiative. The partnership is part of the Department of Defense broader Spouse Education and Career Opportunities program, which seeks to reduce the significant unemployment rate and wage gap currently experienced by military spouses when compared to their civilian counterparts. By joining the Military Spouse Employment Partnership, Frontline National is becoming part of an even larger collective effort to support military spouse employment. For more information about how Frontline National is working to support military spouses in fulfilling their career goals, visit www.FrontlineNational.com. For more information on the Military Spouse Employment Partnership, please visit https://msepjobs.militaryonesource.mil.